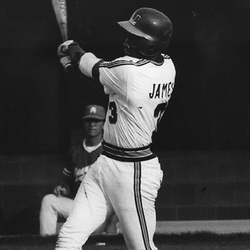 Calvin James was one of the few players to play on both the 1982 and 1985 University of Miami NCAA College World Series Championship Teams. UM Coach Ron Fraser placed Calvin James in right field for most of his collegiate career. At Miami he earned the honor of having his name entered in the record books in 15 different categories, such as: Highest number of bats in a season and in a career; Third in most games played; Fourth highest number of runs scored in a career; Most triples in a career (he hit 3 triples in one game on two different occasions); Second in most number of stolen bases in a season and in a career. In 1984, he was awarded the Bob Warner Memorial Award (voted by his fellow players). In 1985 he was awarded the Arnold Novins Most Popular Player Trophy. Calvin James was drafted in the second round by the Houston Astros in 1985. He currently resides in South Florida and serves our community as a Miami-Dade Police Department Major.